There is nothing animal lovers hate seeing more than a dog in a hot car, and with good reason. Every year, hundreds of pets die in these scenarios due to heat exhaustion. It is reported that it only takes six minutes for a dog to die in a car, so even if you are planning on only being gone for “a minute,” this is sufficient to cause major bodily harm to your furry friend. Even on cool days, the risk of heat exhaustion is real; even on days that are only 70 degrees, the interior of the car can reach over 90 degrees in less than ten minutes! Unfortunately, many people aren’t aware of the perils of leaving their dogs in the cars, even when they are just running a quick errand. With all this said, the threat that comes from sitting in hot cars is real, so if you see a pup in this situation, you naturally want to do something about it. 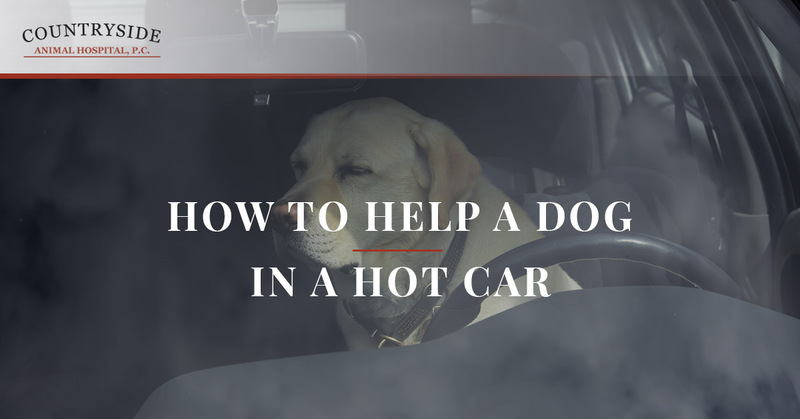 In this blog, we will go over the best ways you can help a dog you see in a hot car to ensure their safety. This may seem silly, but make sure that you have an accurate picture of the situation. It is surprisingly common for people to mistake stuffed animals for real animals in hot cars. In addition, make sure that the conditions of the car pose a danger to the pet before you take action (the car is locked and the A/C isn’t on). It makes sense why you would want to address this situation immediately, but take a moment to assess whether or not it is truly an emergency that warrants your intervention. This will ensure that you don’t inadvertently do something illegal. Speaking of the law, here in Colorado, legislation passed last year that clearly outlines what people can do if they see pets or vulnerable people left in locked cars. This law protects you in the event that you need to break a window to rescue a trapped animal or at-risk person. In order to be protected by the law, you need to have a reasonable belief that the animal is in danger, have assessed that the car is locked and cannot be entered without force, you make an effort to contact the owner, have called the police, and waited for the authorities to arrive before leaving the scene. Once you have determined that the animal in question is truly at risk, collect as much information about the vehicle as you can. Write down the make, model, and color, as well as the license plate number. Alternatively, you can take a photo. First, make an effort to contact the owner. If you are in a store parking lot, quickly find the manager and ask them to page the owner. Be persistent, as this is a life or death situation. The law does dictate that you need to make a reasonable effort to contact the owner before you take action to get the dog out of the car yourself, so do what you can to track them down. If you can’t locate the owner, it’s time to call the authorities. Dial 911 and let them know the situation. While you wait for them, stay with the dog and monitor them; don’t leave until you know they are safe. Ultimately, a dog’s life is more valuable than a car window. If you have reason to believe that the dog is in mortal peril, it is within your legal rights to break the window to save the dog. Again, make sure that the car is truly locked before you seek this measure. At the end of the day, it’s more important to save the dog. At Countryside Animal Hospital, we’re glad that there are fellow pet lovers like you out there to help our furry friends in these situations. We hope this information gives you everything you need to save a dog in the event you see one in a locked, hot car. If you’re looking for a veterinarian in Fort Collins who can help your pet be as healthy as possible, come to visit us at Countryside Animal Hospital. Contact us today!